Each year, Realty Executives International recognizes the leading Executives across our network through our annual awards program. 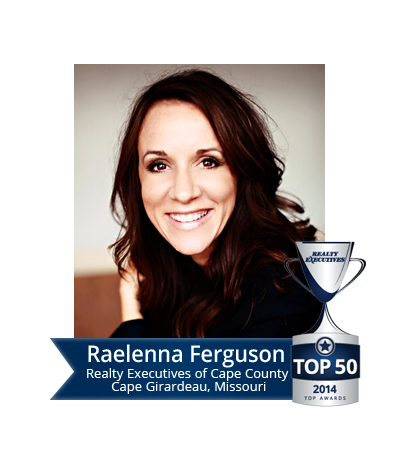 As we celebrate 50 years of real estate excellence in 2015, we’re highlighting the achievements of some of our most successful agents, (we call them Executives) sharing important keys to their incredible productivity in real estate, honoring the ways they make a difference in the communities they serve and revealing what differentiates them from the competition. My business has evolved over the years and I am now at a point where almost 100% of my new business is generated by referrals from past clients or acquaintances. What led you to Realty Executives? I love Realty Executives and I love my Broker/Owners, Bill and Susan Cole. They exhibit the same core values that my husband and I live by. One of the most important factors for me is to work for someone who has a high level of integrity and humility. It’s also important for me to know my Broker has my back. And I feel like Bill and Susan Cole embody all those characteristics. There is no other brokerage I would work for. My company and co-workers are my biggest cheerleaders. When my Realty Executives colleagues businesses are thriving, I am happy and excited for them — and I feel that they have all done the same for me over the last year. As an award-winning real estate professional, you’ve obviously had to work hard to achieve success. What keeps you coming back to your work in real estate, day after day and year after year? I sort of live and breathe real estate. It is almost like an addiction to me. I always tell people, I love this job and if I didn’t there would be no way I would be doing it. It can be a tough business with long hours, but for me I love the challenge of it. I love meeting new people and helping them achieve their goals and I love achieving the goals I have set for myself. I consider myself a listing specialist. Listings are what I enjoy most and are an area of strength for me. The key to my success with listings is to be patient and thoughtful from the beginning. My goal isn’t to just stick a sign in the yard during the first meeting. My goal is to sell the client’s home with their best interests in mind, and that takes more than one appointment. I like to talk with and meet with my clients several times. I want to find out more about them, why they are selling and what their expectations are. Also, I spend a lot of time staging the house and preparing it for the market. I am a self-proclaimed perfectionist when it comes to my listings, from the exterior to the interior to the photos online. I work hard with my sellers to present their home in the best possible way we can.